Flexible - 3 CPU Choices – Entry-Level, Mid-Range, High-Performance. There is a never-ending need to increase data center performance for storage-intensive applications. The Ultrastar® Serv24 is designed to be a performance-optimized platform for software defined storage (SDS). By integrating CPUs and NVMe™ SSDs in the same unit, our storage server provides a tested and validated building block for deploying the SDS stack on high-performance storage.Designed for Fast DataFlash technology has revolutionized the performance of storage systems; NVMe technology extends flash storage to its full potential. 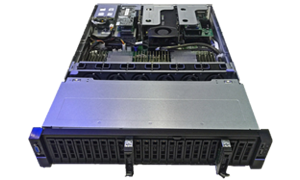 Built upon our storage expertise, the Ultrastar Serv24 features the latest Intel® Xeon® CPUs. Chipset, core count and CPU power can be customized, providing the flexibility to meet varying requirements depending on data workload and performance requirements. Whether as a stand-alone file server or part of a scale-out deployment, the Ultrastar Serv24 is built to deliver screaming performance in software-defined storage environments. With low latency and consistently high bandwidth, data is accelerated to the speed of flash.